My heart broke when I heard the news. He had gone to the hospital on Friday because he hadn’t been feeling well. I expected the doctors to fix him up and send him home like they had done previously when he had a quadruple bypass and cancer surgery. This time the problems were just too great. My family lives in Seattle and my folks live in Minnesota. Although we typically go back to visit every summer, we had just been back last week to attend a celebration of life gathering for my mother-in-law who died March 10th. We stopped briefly to see my parents and enjoyed a delicious meal my mom prepared; we even played a quick game of cards. What a precious gift it was to be able to give him one last hug and say “I love you”. My dad was kind, patient and loving. I learned a lot about parenting from both him and my mom. Probably the greatest thing I learned from them was how to have a loving, supportive, peaceful marriage. I can’t remember them ever yelling at each other or fighting. If they disagreed, they found a respectful way to discuss it. 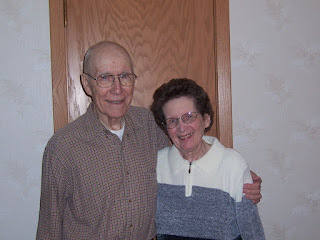 I feel very fortunate to have grown up in a family with parents who had such a strong, loving marriage. I also took a picture before I left. I’ll treasure it forever along with all the other memories of my dad. I am so sorry for your loss, Kathy. I have yet to experience it, but it is coming. My mom is 85 and my dad, 90. How wonderful that you got "one last time" with your dad. What a gift. I will hug, phone, and visit my parents a little more often...we never know when will be out last time. Hope you find comfort in your memories and peace in your sorrow. I am so sorry for your loss Kathy! I can not imagine your loss but know that you are in my family's thoughts and prayers! Thank you for your kind words. We'll be going back for my dad's service and then I'll stay a week with my mom. It will be good to be together. I know how you feel. My dad died @ I am only 9 years old. He went to hospital & they thought they fixed him but he came out & died anyway.